What is a cellphone (Mobile Phone)? An electronic telecommunications device , often referred to as a cellular phone or cellphone. 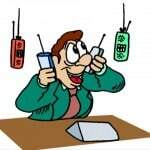 Mobile phones connect to a wireless communications network through radio wave or satellite transmissions. It is used for voice communication. Short Message Service , Multimedia Message Service , and newer phones may also provide internet services such as Web browsing and email. Nowadays, cell phones are very popular. Nearly each of us have it. We like talking on cell phones, sending SMS, playing games etc. Hold the phone – long-term use of a cell phone may cause inner ear damage and can lead to high frequency hearing loss, according to a new study.100 people who had used mobile phones for over a year suffered increases in the degree of hearing loss over the span of 12 months. Furthermore, the study also discovered that people who used their phones for more than 60 minutes a day had a worse hearing threshold than those with less use. High frequency hearing loss is characterized by the loss of ability to hear consonants such as s, f, t, and z, even though vowels can be heard normally. Consequently, people hear sounds but cannot make out what is being said. The researchers warn users of cell phones to look out for ear symptoms such as ear warmth, ear fullness, and ringing in the ears (tinnitus) as early warning signs that you may have an auditory abnormality. They also suggest the use of earphones, which they found to be safer than holding a mobile phone up to the ears. A new study suggests the more you talk on your cell phone, the less you may actually be able to hear.